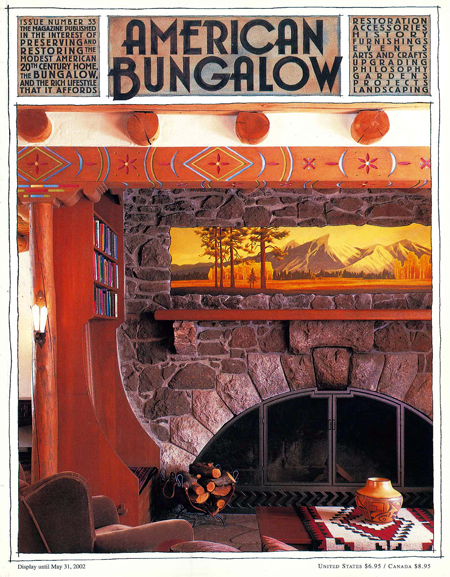 A Southwest/Arts and Crafts Fusion in Flagstaff. Tooled leather purses bring a feminine side to Arts and Crafts. Inside and out in an Iowa bungalow neighborhood. Preview the new bath book and step inside some amazingly colorful rooms..
A quick trip to Portland’s Laurelhurst neighborhood. Step into our editor’s period kitchen. A new fireplace wall transforms a reader’s bungalow. A couple build from scratch using a catalog house plan. A NYC penthouse shelters an amazing collection of early Stickley furniture. Arts and Crafts colors may be wilder than you think. A light hand with an upgrade in Nashville. A new Arts and Crafts conference in the South. Expanding a bungalow into a contemporary family home. Dianne Ayres interprets Craftsman Workshops’ sophisticated style.